On September 11, 2001, the New York TV landscape changed for a long, long time. The World Trade Center tower collapsed upon itself; the 380' high monopole antenna mast in the center slid vertically into the black chaos. The CH 2, 4, 5, 7, 9, 11, 13, 31 and 47 pictures went dark on September 11 on TV sets of the New York Metropolitan Area. Why did the Channel 2 video carrier level remained practically unchanged? CBS kept their old facilities on the top of the 1250' high Empire State Building, 3 miles north of the WTC, in good shape. The transfer of programming occurred instantly. Channel 4 and Channel 5 was forced to move to temporary facilities at the 950' high ARMSTRONG tower in Alpine, N.J. situated 15 miles NW from the old transmitter. For the owners of rooftop antennas the stations offered detailed antenna re-orientation instructions. CATV head-ends experienced similar mis-orientation difficulties, as presented below. The Signal Direction Sheet above displays the computer calculated transmitter directions and distances for the Hillsboro, New Jersey antenna site, before and after September 11. 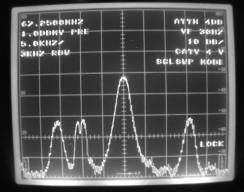 The reception of Channel 2, WCBS remained practically intact, while the Channel 4 direction shifted about 18 degrees. The photograph on the left shows a well balanced low-band video carrier spectrum before the terrorist attacks. The picture on the right exhibits drastically changed signal levels after Channel 4 and Channel 5 relocated to temporary facilities. 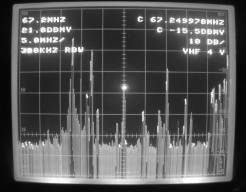 After September 11 the Channel 4 picture quality was also affected by co-channel interference and ghosting. Before, as documented by the photograph on the left, the Channel 4 reception was absolutely free of co-channel interference. 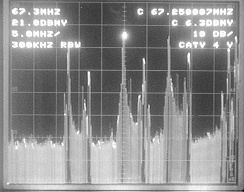 The picture on the right, taken on Sep-tember 20, 2001, shows a -10 kHz beat (two divisions to the left of center) at a -19 dB level. The Channel 4 picture quality was judged unacceptable. The CATV system was advised to install a high quality, rotor-mounted search an-tenna package on the top of their tower. 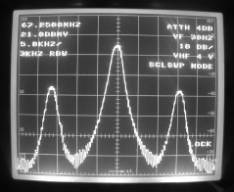 The proper orientation of the search an-tenna resulted in the reduction of ghosting and co-channel interference. metropolitan area CATV systems, are you going to take a wait-and-see attitude, or start planning and implementing your emergency TV reception programs now?